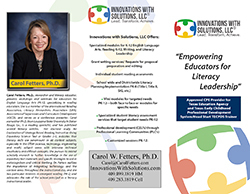 Dr. Fetters has Ph.D. in Curriculum and Instruction with specialization in reading education from Louisiana State University, and is a lifetime Texas Educator with... Click Here to Learn More. Carol ‘s dissertation study, An Exploration of Strategy-Based Reading Instruction Using Expository Science Text in Grades 2-5, (2010) indicates that... Click Here to Learn More. 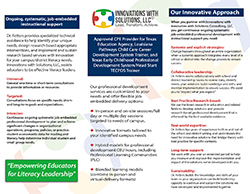 Approved CPE Provider for Texas Education Agency.